Solid Construction: Selfie stick made of Aluminum Alloy & ABS Plastic with 4 lockable tiers extendable up to 3ft (37in). Tripod made of durable steel materials. Portable & Easy Use: Simply set the timer, extend the rod and twist to lock into your preferred length and you’re ready to shoot. Captures photos or video of yourself above the crowds or in hard to reach places. 3-in-1 Use, Fits: Most Smartphone / Digital Compact Camera (1/4in Screw Mount) / GoPro Hero or other action cameras with the included universal adapters. Included Mini Tripod with adjustable ball head and thumb screw locks for multi angle shooting with 180 degree positioning. Mini Tripod allows for table / desktop use or connect your selfie stick to extend the length and attach your camera, smartphone, or GoPro digital action camera. The versatile iKross Selfie Monopod with Tripod is an essential travel accessory. Easily useable as a camera hand grip or extend to use as a selfie stick. You can even connect the selfie stick to the included mini tripod for stable self or group photos. The tripod adjustable ball head easily locks and allows multiple angles shooting with 180 degree positioning. Fits most smartphone, digital Compact Cameras or GoPro 4 / 3 / 2 / 1 HD camera with included universal adapters. Tripod with adjustable ball head and thumb screw locks for multi-angle shooting with 180 degree positioning. 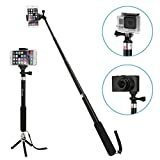 Length: Monopod extends up to 3ft (fully extended). Mini tripod extends up to 9.25in (23.5 cm). Adapters: 1/4in Tripod Standard, Universal Phone Holder, GoPro Tripod Mount Adapter. All iKross (TM) items are covered by one-year limited warranty that guarantees all products to be free of defects in material and workmanship for a period of one year from the date of purchase.